The plants of Ophrys gortynia can grow up to around 40cm in height, with between 3 and 10 flowers carried on a lax infloresence. The lip of the flower is undivided and sometimes has a fine border of yellow around the edge. It typically carries the H-shaped marking on the lip, so familiar from Ophrys sphegodes. The sepals and petals are a yellowish-green colour marked with purple and the flowers protrude horizontally from the flower stem. 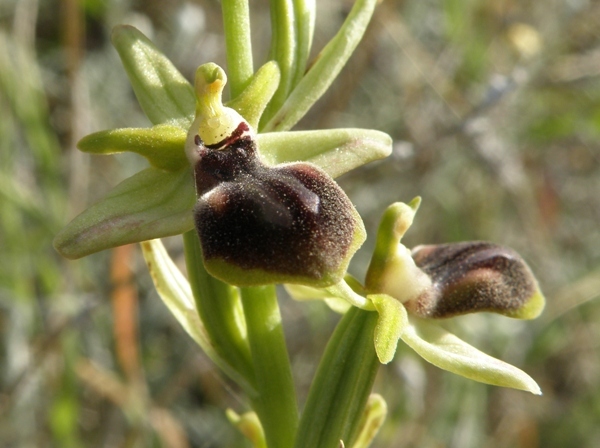 This ophrys is very similar to Ophrys Sphegodes (Early spider orchid) of which it is classified as a subspecies. 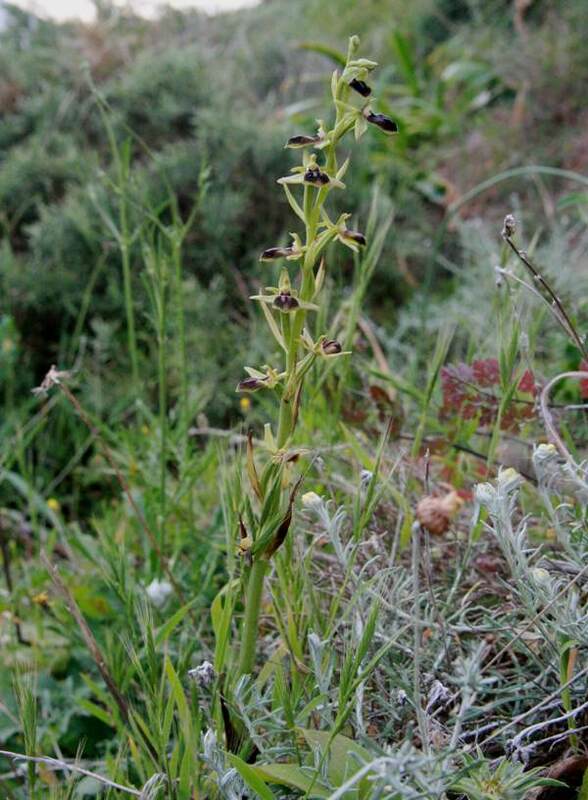 It is part of a complex group of orchids found throughout the eastern Mediterranean which includes Ophrys mammosa. Although superficially similar in appearance there are puzzling differences in flower structure, flowering times and in pollinating insects, which lead to difficulty with accurate identification and certainty as to the true ranges of many of these orchids. 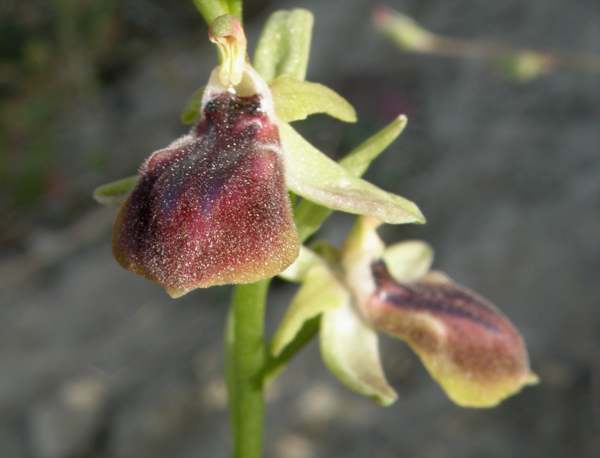 Along with Ophrys cretensis, Ophrys gortynia is endemic to the Greek islands. They both occur most commonly in Crete and are sometimes confused with each other. This is the more usual appearance of Ophrys gortynia - the lip has a fine yellow border around the edge. The flower of this plant has a much flatter lip than the one above but was found growing in very close proximity to it. Ophrys gortynia grows in full sun to mid-shade on dry or slightly moist calcareous soils in short grassland, phygana and on wasteland. Ophrys gortynia flowers later than Ophrys sphegodes - from late March until late April. The plants on this page were photographed near Plakias on the southern coast of Crete in early April.